Still in progress, but this is what I have so far and they can be used as ornaments instead. 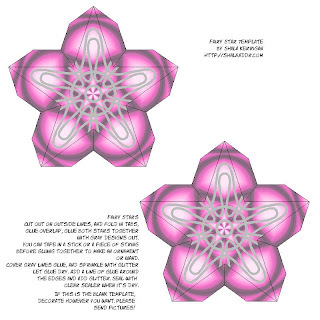 Print the template at 100 dpi on card stock or fit to page, these templates make a 4 inch star printed that way. spray clear sealer of some sort because anything with glitter needs to be sealed so it doesn't dust glitter everywhere. Score folds before cutting, the fold lines are the star itself to fold the tabs inside and glue them. Cut out on outside lines and cut the slit in between each point of the star. Fold tabs in and glue them. With a piece of double sided tape, tape the stick on the back of one wand in two places, check the diagram for the positioning I used or you can use the double sided tape to stick in a piece of floss or ribbon at the top to make an ornament instead. If you're using the blank template and want to use glue on it, don't color it in with crayons or something else waxy, watercolors work nicely. Set aside to let dry, after it's dry, lay down a line of glue on the gray parts of the template or if you're using the blank template, squiggles of glue. Sprinkle a fine glitter over the glue lines. Let dry and repeat on the other side. After that's dry, go around the edges with a bead of glue and glitter. 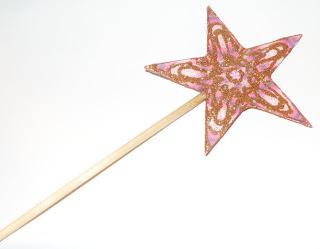 Now you have a fairy wand, and if you're anything like me, you also have a husband who's completely disgusted by the amount of glitter all around you. After it's completely dry, spray with sealer. Click on images for the fullsized versions as usual.